When Hakuho became ozeki after the Haru Basho 2006, he was noticeable for his calm and his reluctance to celebrate the event. 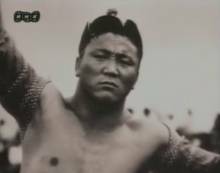 As the son of a national hero who won Mongolia's first ever Olympic medal (a silver for wrestling in 1968) while picking up six national championships, it was clear to Hakuho that he could not be satisfied with the rank of ozeki and only the ultimate rank of Yokozuna would be appropriate for him. And now at last he's done it! After two unsuccessful attempts and a serious foot injury, which left him on the sidelines for a complete tournament, the young ozeki Hakuho demonstrated a control, a maturity and an impressive calmness which enabled him to win his first zensho yusho and earn his promotion to the rank of Yokozuna without any shadow of a doubt. 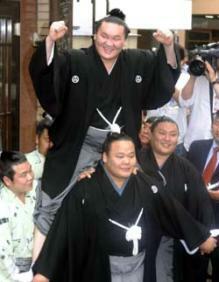 At the start of 2006, Hakuho scores 13 wins at each of the first two tournaments and thus climbs to the rank of ozeki, after having been within touching distance of the yusho in a play-off loss against Asashoryu. Far from suffering from the media madness surrounding his promotion at the age of 21, the young ozeki surprises everyone by acquiring his first yusho in his first tournament as ozeki. 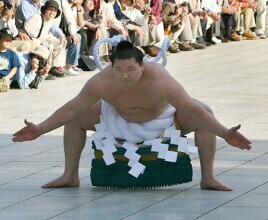 It is true that the injured master Asashoryu has withdrawn from the tournament. But that's not a problem. Pretty much everyone watching thinks that the young Mongolian will not be ozeki for long, following the example of Yokozuna Chiyonofuji and Asashoryu who were ozeki for only three tournaments. In the entire history of sumo, only the legendary Yokozuna Futabayama stayed at the rank of ozeki for as few as two tournaments, completing two zensho yusho on the way to three long years in which he didn't lose a single bout. 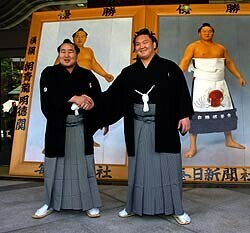 It is thus an historic record that the young ozeki is on the point of equalling at the Nagoya Basho 2006. But the boss is back and cuts the grass under Hakuho's feet. Nevertheless, his achieving 13 wins with such pressure on his shoulders doesn't leave Kitanoumi rijicho unmoved, and he extends the Yokozuna promotion run to the Aki Basho. This time, Hakuho finally shows that he is human and cracks under the pressure, which he has been suffering for months, achieving only a modest record of 8-7. The huge disappointment, and, probably, a lessening of his training, must have something to do with the foot injury which forces him to pull out of the Kyushu Basho 2006. It is the start of 2007 and he has to begin again from scratch. During his long layoff, the fourth youngest ozeki in history bears his troubles patiently and works on the basics. It cannot be denied that he has the necessary talent to go even higher, but to surmount the Asashoryu wall he needs much more than that. It is in his mental attitude that he must make progress if he is going to catch up with the elder Mongolian. At the start of the Hatsu Basho 2007, he is hesitant and his sumo remains feverish, but he does what is necessary to finish the tournament with an acceptable score of 10-5. He is back on track and can now face the master at Osaka. The tournament lives up to all expectations and becomes a yusho race between the two Mongolians with Yokozuna Asashoryu in the extremely rare position of chasing. Asashoryu defeats his junior when they meet up, but the revenge which occurs at the play-off disappoints everyone. Hakuho steps aside at the tachi-ai, which takes Asashoryu completely by surprise, even though he has just done the same thing against Chiyotaikai. With his second yusho, Hakuho now has his third chance to become the 69th Yokozuna at the age of 22 years and two months, which will make him the third youngest Yokozuna in history, behind Kitanoumi (promoted at 21 years and two months [24 yusho]) and Taiho (promoted at 21 years and three months [32 yusho]). For the Natsu Basho, Hakuho is again in the centre of a media frenzy, under the amused glance of an Asashoryu who has promised to be an insurmountable wall. Exactly three years before, Hakuho rendered Asashoryu a huge service at this same Basho in makuuchi by beating Hokutoriki on the last day. This time it is for the white Phoenix to fly with his own wings and to free himself from his tutelage. On the 10th of May, Hakuho becomes the proud father of a little girl weighing 3.5 kg. This additional responsibility at the age of 22 can only calm him down and allow him to work out his priorities at this vital tournament. He nevertheless trains with great zeal, to the point where he is asked not to make martyrs of his opponents. With impressive calmness, he sees off his opponents one after the other, and they don't hesitate to praise him in interviews. Chiyotaikai, who has himself been in this situation several times, is convinced by the young man's self-confidence. No one will stop him, not even an Asashoryu who is injured during this fortnight. Promoted to the top rank, he chooses the Shiranui style for his dohyo-iri, paying his respects to Yokozuna Yoshibayama, from the same stable as himself. This style has a reputation for bringing bad luck but Hakuho doesn't take any notice of that. He has stated repeatedly that his aim is to become a dai-yokozuna, following the example of his father in Mongolian wrestling. To achieve that, he needs to gather another seven yusho from a vengeful Asashoryu. What beautiful fights we have in prospect!